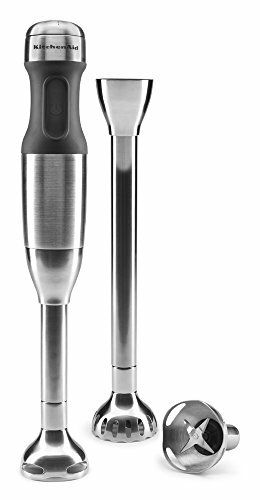 Looking for a stainless steel stick blender? You're in the right place. Here are 9 immersion hand blenders made of stainless steel so you can find the right option for your budget and application. 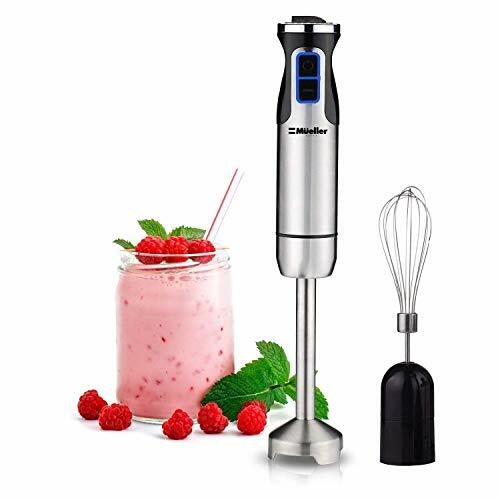 Enjoy the trigger operation to easily control this immersion blender without causing your finger to get too tired trying to push down on a button to make the blender operate. The adjustable speed means that you have complete blending control and that you don’t need to worry about whether or not you will be blending too fast or too slow. The non-scratch base on the bell blade ensures that you don’t accidentally scratch the bottom of the pot that you are blending in, and, thanks to the 8” stainless steel arm, you will be able to blend deep amounts of food without a problem. 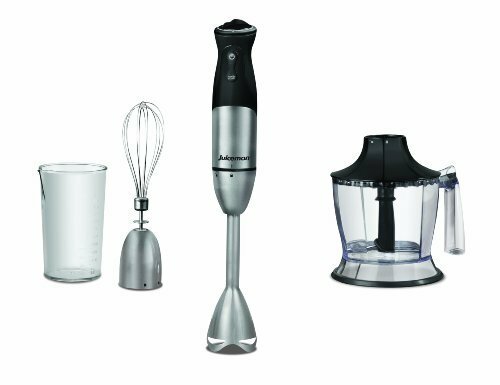 Not only is this blender from Braun designed to be comfortable to hold and easy to use, but thanks to the stainless steel shaft and blades, it is also a very powerful immersion blender, and one that will make short work of any task in the kitchen. You can attach or detach the attachments with a simple click, and that sound will help you to rest assured that the attachments are secure and are going to work correctly. The included 20-ounce beaker is large enough to allow you to blend or chop inside of it without worrying about whether or not you are going to make a mess. 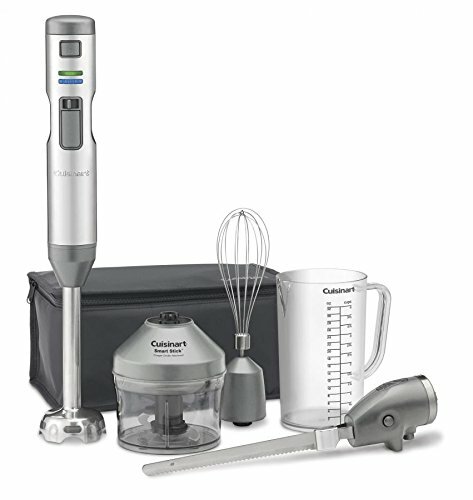 Unlike other immersion blenders that are corded and therefore keep you tethered to a certain location in the kitchen, this blender from Cuisinart is cordless and rechargeable so you can take it with you around the kitchen without having to worry about where an outlet is located. Because it can run 20 minutes on a single charge, you don’t have to worry about running out of power to blend, chop, whisk, or cut. 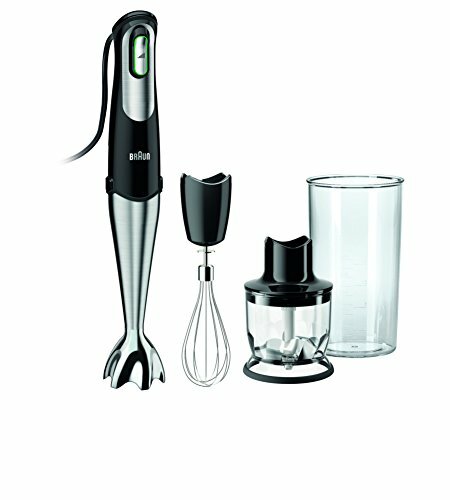 Not only is there a whisk and additional chopper, but this immersion blender comes with an electric knife. This attachment is fast, powerful, and easy to use, and it will make slicing through bread simple. 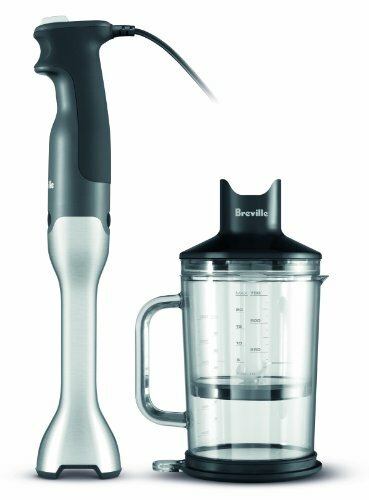 Not only do you have perfect control over this immersion blender, thanks to the five different speeds and the power boost, but the 550 Watt motor can power through most any ingredients without any problems. Thanks to the extra large chopper bowl as well as the tough blades, you won’t run into any issues with chopping through even the toughest and hardest ingredients. Switch over to the whisk attachment when you want to whip almond or coconut milk to a light and frothy consistency, and make sure that everything stays contained when you use the enclosed blending beaker. 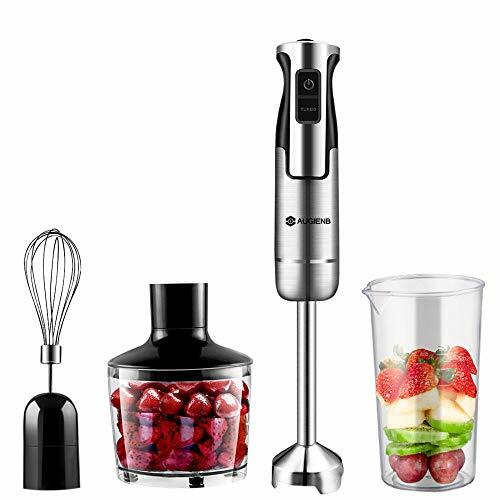 Not only is this a powerful immersion blender that can easily chop through ingredients, but because you can easily swap out the attachments, you can also beat and whisk without having to pull out another appliance. Thanks to the sturdy stainless steel construction, this immersion blender has been built to last for a very long time. You can choose between three different speeds to make sure that you are able to create the perfect food. All of the detachable attachments are incredibly easy to clean and detach easily from the wand with just one hand. 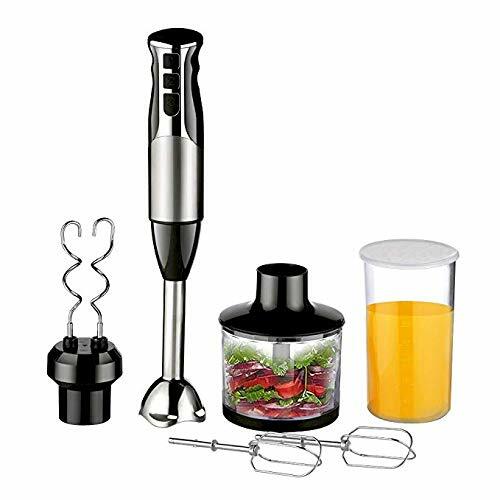 This powerful 4-in-1 appliance is able to whisk, puree, whip, chop, blend, and emulsify quickly and easily, thanks to the durable shaft and the many different attachments. You don’t have to fill your kitchen with a lot of different appliances when you opt for this one immersion blender, as it can fill the role of many others. Not only is this blender easy to use, but it is BPA free, so you don’t need to worry about health risks when using it. When you are ready to clean up, put the accessories in the dishwasher to make the task as simple as possible. Thanks to the two year warranty on this blender, you don’t have to worry about it breaking when you need it most. The stainless steel arm is durable and easy to clean, preventing you from having to spend a lot of time cleaning your immersion blender each time you use it. Additionally, the motor has been designed to withstand continuous use without breaking. Unlike other immersion blenders, this one from Mueller is not just comfortable to hold and to use, but also has a motor that will last for a very long time without breaking or wearing down. 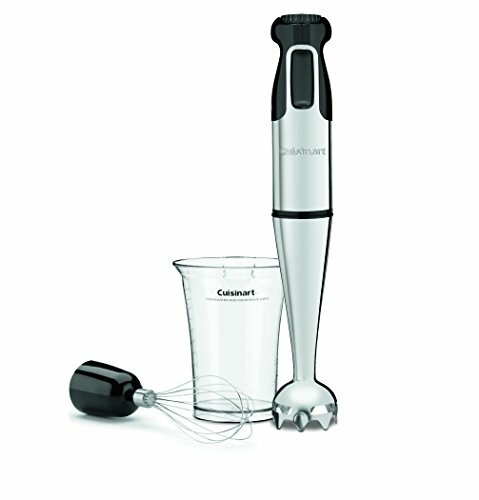 You can keep it simple in the kitchen with this durable immersion blender from Cuisinart. Thanks to the variable speed control and the blending and whisking attachments, you will be able to prep and cook with ease and without having to wash out a lot of larger kitchen appliances when you are all done. The comfort grip handle not only makes this immersion blender easy to hold onto when you use it, but also prevents you from accidentally dropping it when your hands are tired. It is strong enough to create a very smooth and creamy puree but still quiet enough that you will not disturb other family members or co-workers when you use it, which makes it a welcome addition to any home or office. Thanks to the five speeds on this powerful blender, you can easily tackle most any kitchen task without a lot of work or worry about whether or not your appliance is strong enough to handle the work. Choose from three different bell blades and other attachments to whisk, whip, chop, and blend. They are small enough so that they do not take up a lot of storage space in your kitchen, which is great if you live in a smaller space. Being able to choose between an 8” and a 13” blending arm so that you don’t have to worry about accidentally getting your hand in the food that you are blending.